We are selling German embroidery thread, Vplus Embroidery Threads and acrylic embroidery thread in more than 500 diffrent shades. 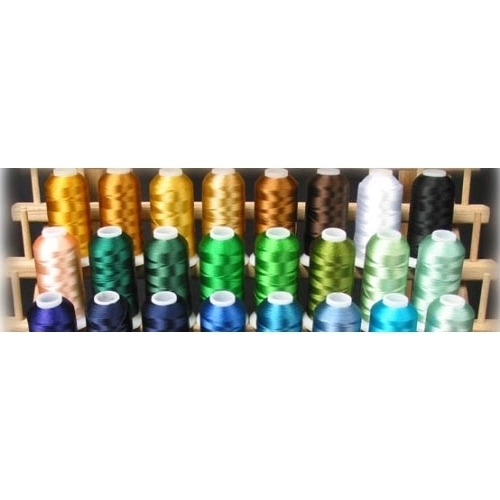 We are one of the trusted manufacturers & suppliers of viscose embroidery threads, rayon embroidery threads, polyester embroidery threads, trilobal polyester embroidery threads and silkoplus German embroidery threads. We strive hard to to deliver high quality yarns and threads to meet specific needs of our clients. With years of rich experience in the field, we have developed our expertise in creating products with style and ease, improving our clients turnaround time and increasing their profits. Our assortment of yarns and threads includes viscose yarns, dope dyed yarns, raw yarns, viscose embroidery threads, polyester embroidery threads, sequin tape, embroidered fabric and computerized embroidery machine.